If you live in Needham any time at all, you quickly learn this one important fact about the Needham High School football team – that the annual Thanksgiving Day game against Wellesley is the oldest rivalry of its kind in the country. The fight has been going on since 1882, ever since East and West Needham split apart, taking their respective high schools with them. “The Needham-Wellesley Thanksgiving Day football game will be played this year by strictly town teams. This is a return to the old custom under which better games were played and more enthusiasm created, than has been the case in the past two or three years. The game, played on the 28th, ended in a scoreless tie. The inexperience of the players was evident as “both sides fumbled very freely”, although “a few slugging matches livened up the game”. So much for schoolboy sports lore. We know that the earliest Needham-Wellesley games were actually played by schoolboys, playing an extension of their old East District – West District contests. For a couple of years at the end of the century, however, it seems that rivalry overtook sportsmanship, and the ball was entrusted to the surer hands of ringers. This first team was not too promising: “On the afternoon of September twenty-eighth, the candidates for the foot-ball team assembled in a room in the high school building and elevated John Burrage ’06 captain of the eleven. From that date until the first game [about a week], the team practiced two or three afternoons and contrived to partially master a set of signals beside putting in condition and marking out a gridiron on the field at the corner of Great Plain Avenue and Pickering Street [Greene’s Field]. In the movies, these courageous but inexperienced striplings would somehow manage to pull off the big win, despite the fearful odds. But the movies were not invented yet – This was real life. The Needham team scored “two touchdowns and two goals”, for a total of 12 points, shutting out the Natick team and gaining their first victory of the season. They would go on to end the season with 6 wins, 2 losses and 2 ties. They trounced the Norwood team (“the only team of its own size that Needham encountered”), an astonishing 49-0. The Thanksgiving Day game, incidentally, was played that year against their first opponent, Natick (Needham 18, Natick 0). Needham did not play Wellesley at all that season. The autumn of 1905, however, saw the two rivals once again finishing the season against each other (alas, Needham 6, Wellesley 11). 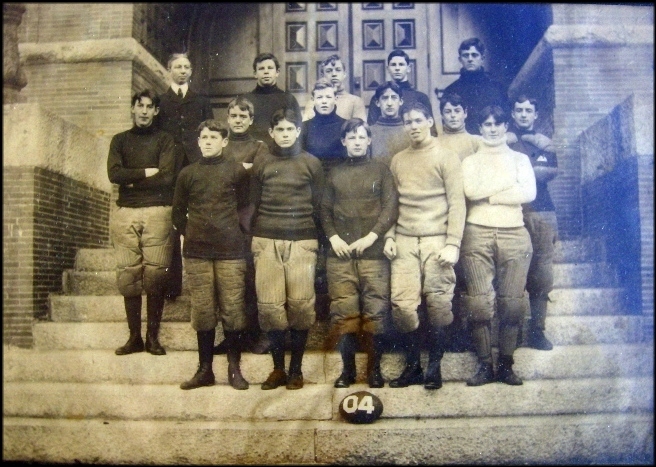 The Needham High School football team for 1904 poses on the steps of the High School (now the Emery Grover Building). Manager Nat Wyeth is in the top row, third from left; Captain John Burrage is next to him, fourth from left. The quarterback was Frank Stanwood, third from left in the second row. Nat’s brother Edwin is in the front row, second from right.